In early April, Baku-Ceyhan-Tbilisi (BTC) achieved a milestone by lifting its 100 millionth barrel of crude oil onto the Seaprince at the Ceyhan Terminal in Turkey. This was the 130th tanker lifted from Ceyhan and a major step in BTC's goals towards maximum capacity. Exports via the BTC pipeline are running ahead of expectations and remain on target to achieve one million barrels per day in late 2008. At its peak, the Ceyhan Terminal will fill one to two tankers per day. In March, BTC made the final commissioning of pump stations and conversion of all pumps in Azerbaijan and Georgia from diesel fuel to gas turbines. This enables BTC to export its design capacity of one million barrels of oil per day. It has already exceeded an export rate of 800,000 barrels of oil per day and now is capable of ramping to its design capacity of one million barrels of oil a day. The pipeline's record daily throughput to date was 882,000 barrels, which was achieved in April. Left: BTC (Baku-Tbilisi-Ceyhan Pipeline) steadily moves towards the goal of exporting one million barrels per day through the export pipeline from the Caspian to world markets. While the pipeline initially carried only Azeri-Chirag-Gunashli (ACG) oil, deliveries of Shah Deniz condensate into the line have been ongoing since the start of Shah Deniz production in January. It is expected that future volumes will include those from the other side of the Caspian Sea. BTC is a world-class pipeline, which is expected to make a positive difference by bringing significant benefits to the region. By avoiding the Turkish Straits, it will help relieve the inevitable growth in oil-related traffic and associated environmental risks, while creating substantial revenues for the transit countries. As well, it will strengthen economic and political links between Azerbaijan, Georgia, Turkey and the West. 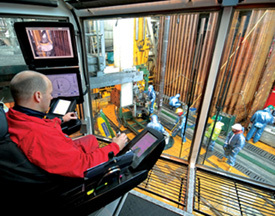 The jacket for the Phase 3 Drilling, Utilities and Quarters Platform (DUQ) sailed away on April 9, 2007, from the Heydar Aliyev Baku Deepwater Jackets Factory (BDJF) and was launched offshore and docked onto pin piles at the template location in the Deepwater Gunashli (DWG) part of the Azeri-Chirag-Gunashli (ACG) field on April 11.
is more than 90 percent complete. transportation and hook up and commissioning of the TPG 500 platform. This jacket was fully constructed in Azerbaijan, using the local construction infrastructure at BDJF facilities. The total weight of the jacket is about 15,800 tons. The height of the jacket is about 190 meters, and it was installed at a water depth of 175 meters. 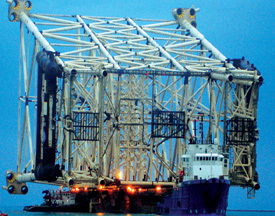 The jacket has 12 piles weighing more than 7,000 tons. The construction of this jacket was completed ahead of schedule during the third quarter of 2006. It was loaded out onto the transportation barge STB-1 at the BDJF quayside last September and remained there through the winter, ready to sail away for offshore installation in April 2007.
offshore and docked onto pin piles at the template location on April 11. Bruce Luberski, BP's Vice-President, Major Projects commented: "I am very pleased that now the jacket is offshore at its permanent location. The transportation and launch activities have been accomplished very successfully and most importantly in the safest possible way. This clearly shows that we have been able to create and maintain a project production line in the Caspian and undertake each stage more efficiently than the previous one." "The year 2007 is expected to be both the culmination and final link in this project chain which has consisted of construction of six world-class offshore platforms. Between now and the fourth quarter, we will install two jackets and two topsides for the last two ACG platforms. I would like to take this opportunity to thank all my team and those of the contractor companies for their outstanding delivery of the promise," Luberski said. The transportation and installation of the jacket used a number of SOCAR/KMNF (Khazardenizneftdonanmasi) vessels, including the two principal installation vessels: the Derrick Barge Azerbaijan (DBA) and the STB-1 launch barge. The installation work has been carefully planned and it is expected to take 45 days to complete, including allowance for adverse weather conditions. Left: BP and their partners are committed to involving more and more local companies in their contracts and transfer of knowledge. The last jacket to be built for Phase 3 will be the Production, Compression, Water Injection and Utilities (PCWU) platform. The construction of this jacket is now approximately 97 percent complete and we plan to install it offshore during the second quarter of this year immediately following the DUQ jacket. The ACG Production Sharing Agreement (PSA), signed in September 1994, covers the 30-year development of the Azeri-Chirag-Gunashli contract area. It is estimated that 5.4 billion barrels of oil will be recovered during the PSA period. The field is being developed in several phases: Chirag has been producing since 1997 as part of the Early Oil Project (EOP). This was followed by Azeri Project Phase 1: Central Azeri production in early 2005. Successive phases have included West Azeri, which began production in 2006, and East Azeri, which came on stream in October 2006 as Azeri Project Phase 2. The final ACG development phase - Phase 3 (Deepwater Gunashli) - is under construction and expected to begin production in 2008. The current total daily production rate of ACG is more than 700,000 barrels per day. The company is planning to produce 708,000 barrels per day average from the four platforms in total for the full year. 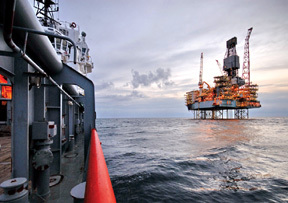 Of this, 141,000 barrels per day is expected to come from Chirag; 257,000 barrels per day from Central Azeri; 168,000 barrels per day from West Azeri; and 142,000 barrels per day from East Azeri. 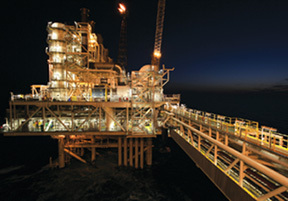 Above left: Central Azeri platform in the Caspian at night. Early in 2007, BP and its co-venturers inaugurated new water purification facilities in the Sigirli and Karrar villages of the Kurdamir district of Azerbaijan. The facilities will be operated by two local companies especially established and trained as part of our commitment to the development of local enterprises. This project is part of a larger initiative called the Improvement of Provision of Potable Water (IPPW), which was launched in 2005 by BTC/SCP (South Caucasus Pipeline) under their Community Investment Program (CIP). These companies have included a water purification program for those communities, which need potable water. The IPPW has so far provided water purification facilities for six communities using locally available technologies. The IPPW has also created management structures for each facility in the form of community-municipality owned limited liability companies to manage water quality and revenues effectively and with transparency. The IPPW has been implemented by the UMID Humanitarian and Social Support Centre. The total cost of the IPPW is over USD 190,000 which will provide access to potable water for more than 6,000 people in the communities of Sygyrly, Karrar Kand, and Karrar Gasaba in the Kurdamir District; Bargushad and Gulaband in the Ujar District; and Orta Laki in the Aghdash District. Dan Bliss, BP's Future Communities Programme Director summarized the program: "BP and our partners are proud to sponsor this important community initiative. It will clearly bring benefit to the local people by providing reliable sources of potable water, which are important for health and hygiene. The modern purification units installed in the communities will operate on solar energy and, thus, will save community energy costs as well." BP and its co-venturers also began Phase 2 of the Supplier Finance Facility (SFF) in 2007. This is an important local enterprise development initiative. The pilot phase was launched last year following the approval of Phase 2 funding. Phase 2 is significantly larger in scale and builds upon the successful implementation of the pilot phase. This will facilitate further loans to more local supplier and service companies. The SFF is designed to give greater access to finance to Azerbaijan's local oil and gas industry supplier and service enterprises. It is a joint credit facility established by BP on behalf of its co-venturers and the International Finance Corporation (IFC). In addition, IFC has signed a separate agreement with the Micro-Finance Bank of Azerbaijan (MFBA), which was selected by the IFC for implementation of the project. The facility will use the resources and funding provided by the three parties involved. Phase 2 provides access to a further $15 million of financing to local SME contractors of BP and its co-venturers. Of this 40 percent ($6 million) has been funded by BP and co-venturers, and IFC and MFBA funded the remaining 40 percent and 20 percent respectively. 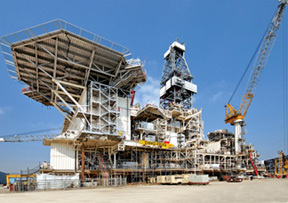 This project is in line with BP's target to double its total spending with local companies in Azerbaijan by 2010. Ibrahim Ismayilov, BP's Regional Development Initiative Manager in Azerbaijan noted: "BP and its co-venturers are pleased to have the opportunity to be part of this important initiative to foster the development of Azerbaijan's local enterprises. SFF is more than funding as it combines the strengths of each of the partners with the objective of improving access to finance, so that local companies can take a bigger share in BP's and its co-venturers' supply chain. This, we believe, will promote broader participation in their country's economic growth." "In addition, SFF has a long-term objective of contributing to the development of a strong and sustainable local SME supplier base in both oil and non-oil sectors and to generate increased employment opportunities for the country's future. BP and its co-venturers remain committed to contribute their knowledge of the oil and gas supply chain and their experience of cooperation with local suppliers. To that end we will continue to provide technical support and training to suppliers through our programmes and the Enterprise Centre," Ismayilov said. Local companies eligible to receive SFF loans will be selected for competitive pre-qualification exercises by the Enterprise Centre. They will then pass through the MFBA credit appraisal and will finally be approved by the SFF Supervisory Committee comprising representatives of the three parties involved. BP together with its co-venturers is implementing world-class oil and gas development and export projects in the region. These projects present a great opportunity to make a positive difference to the people of Azerbaijan, Georgia and Turkey. As part of their efforts to achieve this in Azerbaijan, they have set an ambitious target to double the value of contracts placed with local companies - a five-year goal that began in 2005. This target aims to encourage enterprise development in the country by assisting in diversifying its economy, as well as creating innovative and transparent facilities in support of local businesses. In addition, BP and its co-venturers have committed to spend around $20 million a year through their Regional Development Initiative and Community Investment Programmes. 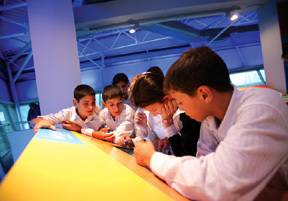 In Azerbaijan, these regional development and community programs focus on three key areas: community investment, enterprise development and effective governance. Through these programs, they will continue to work with local communities in collaboration with local and national authorities, non-governmental organizations, the private sector and other stakeholders to help ensure that long-term, sustainable investments will benefit all. BP, as the operator of Azerbaijan's major oil and gas development and transportation projects on behalf of its co-venturers, recently extended an existing contract with the local company Petrochem Group. The extension covers provision of lubrication management services for the total limiting value of $3.6 million for the next two years. Under this contract, Petrochem Group will be responsible for inventory management, demand planning and expert advice in support of the Azeri-Chirag-Gunashli (ACG), Shah Deniz, Baku-Tbilisi-Ceyhan (BTC) and South Caucasus Pipeline (SCP) facilities. The new scope of work includes the provision of support for stocking, including the monitoring of minimum and maximum levels of stock, quality assurance and quality control checks, rationalization, and forecasting. The contract also covers the tracking of freight movements, liaison with BP personnel on anticipated volumes, alternatives for any long lead-time or obsolete lubes, development of lubrication strategies for various installations, management of lubricant oil database, filtration/clean up and ferrography predict. 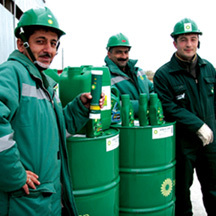 Petrochem has been responsible for the sole distributorship for BP Lubricants in Azerbaijan since 1993. The Sixth Biodiversity Competition in Azerbaijan has been announced. The competition will be conducted in two categories - Best Biological Diversity Project and Best Environmental Awareness-Raising Project. Awards will be announced in December 2007.